Face Value: Other cover artists take note. This is a beautiful, resonant cover that speaks to the book meaningfully without giving too much away. We see the girl, her whole body, but not too close up. We see the farmland, the vast landscape that evokes a sense of Cameron’s solitude. It’s absolutely gorgeous. Does it Break the Slate? It totally does, even if its not always in the way that I want it to. Cameron does what she can with her situation and takes care of herself in the best way possible. Sometimes my reader-self really struggled with the horrible things that happened to Cameron, the way she was treated and her limited options. I wanted a big bold confrontation, where she fought the system and won. I didn’t’ get that, and that’s ok. Sometimes a quiet chipping away at the slate is what’s available to you, and it still totally counts. More details in the full review. Who would we give it to? This is another great addition to your LGBTQA section of your library, and a really good choice for lovers of realistic fiction. Cameron’s journey is so empathetic, and the story is beautifully told. Small town life is really honestly captured. Review: The Miseducation of Cameron Post takes place in the recent past – the late 1980s into the early 1990s. It’s not quite historical fiction, but still, it’s very much of its time. Setting this book in the distant past drives home both how far we’ve come and how far we still need to go. Certainly, a lot of today’s gay teenagers have more options than Cameron did. There’s far more acceptance and many more gay people public life. There are things like Dan Savage’s It Gets Better project and Gay Straight Alliances in many public schools. However. This kind of terrible treatment is still happening, and just because those resources are out there doesn’t mean that all kids and teens have access to them. Having books like this one on library shelves is incredibly important. Cameron’s journey could easily be a catalyst for someone else’s, a dynamic force for good things. 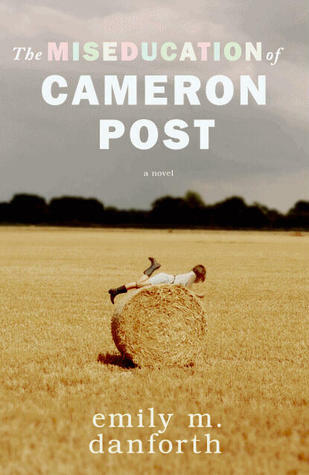 The book starts on the day Cameron’s parents die in a car crash, the same day she kisses a girl for the first time. Her well-meaning, deeply religious Aunt Ruth moves to Montana to raise her. We follow Cameron for the next several years as she grows up, discovers herself and her sexuality and has to figure out how to be the person she is. Ultimately, she is exposed and sent to a boarding school meant to reform gay teenagers. I loved Cameron’s character. At times I found her a little too self-aware – but for the most part I found her first person narrative incredibly compelling. It would be hard not to read the book and empathize with her. Her emotion journey is decidedly Slatebreaking. But another thing the book gives us is complicated villains. Aunt Ruth is not evil. She loves Cameron. She moves to Montana, gives up her life to take care of her. She thinks she’s doing the right thing. She does some truly horrible things to Cameron in doing it, she’s incredibly wrong, but we see the complexities embedded in these terrible things. Likewise with the awful boarding school she ends up at, God’s Promise – they think they’re doing the right thing. They aren’t. But how much more complicated, interesting, and real, to have to deal with good people who do terrible things in the name of what they think is right? Danforth also gives us some fantastic, Slatebreaking supporting characters. And she writes painfully believable teenagers. Lindsay, Cameron’s swim team friend and guide in all things lesbian (she’s from Seattle, after all, and just spends summers in Montana with her father) rang so true to me, with her mix of posturing and uncertainty. I totally had those friends. And the friendships that Cameron builds at God’s Promise, are clearly, and plausibly, what gets her through. And then there’s the ending. I had a lot of thoughts about the ending, and I feel that its important to share them in this review. I’m trying to be cryptic, but I’m going to reveal some things about it here, so if you’re one of those people who can’t stand to be spoiled, please stop reading now. At first I found the ending of this book really disappointing. Emotionally, I wanted Cameron to stand up for herself, take down the man, show them that she’s amazing just as she is and ride off into the sunset kissing a girl. Or at the very least, I wanted to see her going to a good, nonreligious college in a bigger city where she could find people who accepted her, to see her growing up into someone amazing and proving her aunt and small town and all the people at God’s Promise wrong. I did not get that ending. Instead, we get a smaller ending. Cameron and her closest friends leave God’s Promise. They run away. But when the book ends, we don’t know really how things are going to work out for them. There’s not a plan. There’s not a success. And when I first put the book down, I found myself seriously disappointed. I had become so invested in this character, and I wanted to see her finally get to be happy. But the more I thought about it, the more I felt like the ending we got is the ending that fits the book, much better than my vision for how things work out. Quiet Slatebreaking is still Slatebreaking. Cameron’s emotional triumph is still major. She’s still taking her life into her own hands and working within her own means to be the person she is in the place she needs to be. This entry was posted in Reviews, Young Adult and tagged Coming of Age, Coming Out, LGBTQ, Religion, Small Town. Bookmark the permalink.